Are you a good runner? Let's check it! 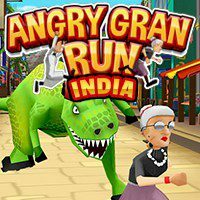 This time our cute, but really angry grand mom in wonderful country India! There are a lot of interests, but you main goal is to run as quick as possible and avoid all obstacles on the way! Our favorite grandma in India now! If you think that all grandmothers are very cute, nice and kind. No! All these are not about our Angry Grand Ma! She is so angry. She has even more energy then you! Help her to run through the mystic streets of India that is full of fruits, spiceries, and many others. Use the arrow keys to run, jump, slide and turn left or right. Be careful and try to avoid all obstacles. By the way, all passersby are not your impediment, just push them aside! Be sure that you will cope with it at any rate! Set a record and you will be thanked!